"Isabelle Thornton" Le Chateau des Fleurs: Gorgeous Owl wreath DIY for Fall, easy! 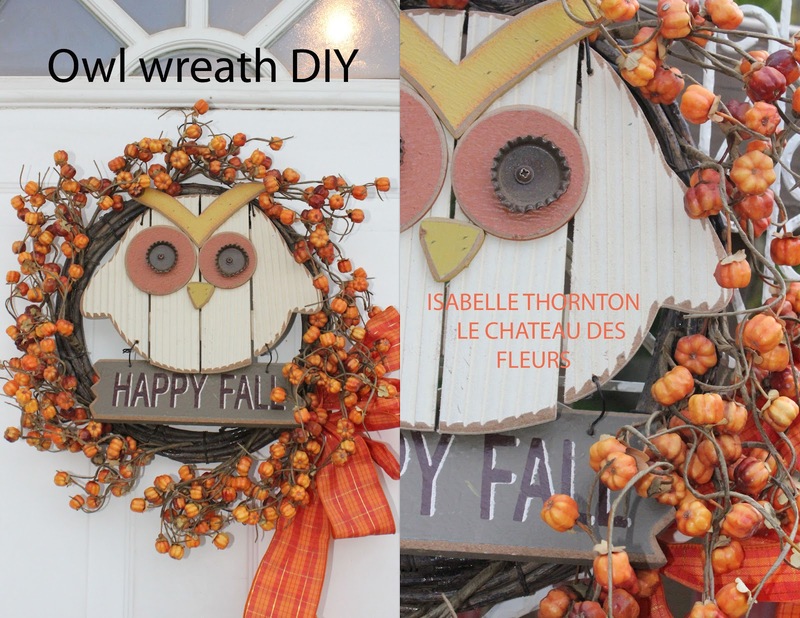 Gorgeous Owl wreath DIY for Fall, easy! This is my own idea. Owl wreath for Fall. I got this cute owl plaque at the store (find it at Walmart or Michael's). I am kind of obsessed with owls...I put this plaque on my door and it is banging the door when you open it and boring...So i thought to make it into a wreath. Cute owl plaque, made of wood. Simple wreath, with tiny pumpkins. Choose your ribbon to match. Fold it to make 2 small and 2 big loops. Secure with a simple trash bag tie. The owl goes in the middle of wreath. Secure with ties. Place the bow on the side. Great for my front door or anywhere in the house. Pics and ideas are my own, if you would like to use my pics or ideas, please link back to me. Oh, I just love it! You have made a few delightful wreaths! thank you for sharing! That is so cute Frenchy girl. I love owls! Happy Monday to you. So cute, I love owls. How cute your wreath turned out! Nice work. You also have a lovely blog. Oh my gosh. This is so cute! Adorable wreath! I love it!